Part#: SC93301 / 01-SCC93301-XX00C003 / MCP-220-00024-0B. For use in SuperMicro Servers SC826, SC846. SuperMicro Chassis Compatibility Technical Support. Used in perfect condition. The item used in perfect condition. Once an order has been paid, we will test the server and apply any BIOS updates necessary. It is our goal to help you in every step of purchasing a server from us. Server Essentials. Storage Works / Storage. Supermicro Accessory 2.5" HDD Tray in 4th Generation 3.5" HOT SWAP TRAY. These are caddies only! Supermicro 01-SB16105. Condition Used. Product Specifications. 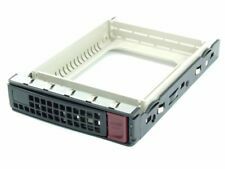 Lot of 10 SuperMicro 01-SB16105 2.5" SAS/SATA Hard Drive Caddy Tray - Trays only. Manufacturer: SuperMicro. 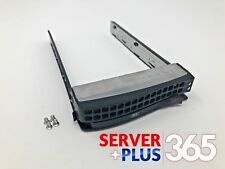 SuperMicro 05-SC82708-XX00C104 3.5" Server Dummy Drive Tray Caddy. Screws are NOT included. Condition Used. Product Specifications. This is latest generation 5.5 HDD Tray with Hollow-Panned Dummy designed to be use with various existing chassis. GENUINE 01-SC93832 SUPERMICRO TRAY FOR 3.5" LFF SATA/SAS DRIVE. Dummy Tray Square Pattern - Black. Clean, new pulls from SuperMicro 6028R-WTRT chassis. Believe these are the Gen 5 drive trays. Supermicro 2.5" to 3.5" adapter for Caddy for Supermicro Servers. Install a 2.5" Drive into a 3.5" Caddy. MCP-220-00043-0N HDD Tray. - Item tested to power on and all specs show in BIOS, We Warranty Hardware Only, not Software. DOES NOT INCLUDE RAILS. 5.25" DRIVE TRAY. SQUARE PATTERN BLACK. Unless otherwise noted. No exceptions! THIS ITEM IS NEW, SEE NOTES. SUPERMICRO MCP-220-00118 Gen 5.5 Drive Bay Adapter 3.5" to 2.5"
Manufacturer: SUPERMICRO. Gen 5.5 Drive Bay Adapter 3.5" to 2.5". Product Type Drive Bay Adapter. Compatible Drive Bay Width 3.5". Item Report. Use third-party freight forwarding services at your own risk. Supermicro SC81302-XX00C004. Condition Used. Product Specifications. Solid State Drives. Hard Drives. Part Number: SC93301 / 01-SCC93301-XX00C003 / MCP-220-00024-0B. Asset recovery and recycling services. The truth is out there! Server Parts. Compatible with the following systems and possible more. Item is refurbished and was pulled out of a working system. Item appear as pictured. We will respond promptly to your inquiry. Plastic spacer only. Fits into SuperMicro hot swap 3.5" hard drive trays. No screws. Screws are NOT included. Item Condition Used. Manufacturer: SuperMicro. Part Number: 05-01-820611-XXA. Warranty against DOA provided. Local pick-up is available for those living in the Boston area. One piece of CD DVD bezel for Supermicro. ONE piece of black Faceplate Flat BEZEL as picture shows. There are(3) Super Micro 01-SC93301-xx00C003 & (5) 05-SC82708-xx00C104. All were pulled from Super Micro servers. As the pictures show, five have the plastic trays and three do not. This hard drive tray is compatible with various Supermicro chassis. Each hard drive tray is validated to ensure quality. 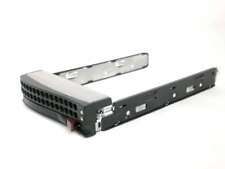 ITEM: (BOX J) SUPERMICRO HARD DISK DRIVE SERVER CADDY 01-SC81302-XX00C004 3.5" SATA DRIVE. 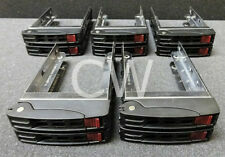 These hard drive caddies were pulled from working SuperMicro CT-SC040 servers. These hard drive caddies have been tested and are in 100% working condition. Other compatible part numbers are: 05-SC82708-XX00C104 and 05-01-815105-XXA. Pulled from Supermicro 2U SuperServer 6023-P-8R Rackmount Case. May not work for all Supermicro 2U SuperServer, subject to manufacturer. Application: 5.25" Drive Bracket for Supermicro 2U Rackmount Chassis. We'd like to settle any problem in a friendly manner. We want to make sure you are happy with our item. WHAT IS SHOWN IS WHAT YOU WILL RECEIVE. जो चीज है वह आपको मिल जाएगी जो आपको मिल जाएगी. O QUE É MOSTRADO É O QUE VOCÊ RECEBERÁ. Supermicro 2.5" SAS / SATA Hot-Swappable Hard Drive Tray Caddy w/ Dummy Bays. Hot-swap HD Tray for Supermicro Chassis. Sorry, no exceptions. Security and your privacy is our number one priority. Technical Support. Used Pull -The product has been removed from a working system (e.g. server). These products vary in their usage due to age of system &type of service etc. Manufacturer's Part Number:SC80302. Part# 01-SC81302-XX00C004. This is a tested working, used, clean,LOT OF 2, SuperMicro 3.5" Hard Drive Trays/Caddies. SuperMicro Part #.
) During past month. Negative 0 1 2. Neutral 1 4 6. Positive 78 594 1180. kcl5trades ( 463. abcvkids ( 400. cwaem-vwtvv6ag ( 3 ) During past month. ). Pulled from Supermicro 2U SuperServer 6023P-8/i Rackmount Case. Pulled from Supermicro 2U SuperServer 6023-P-8R Rackmount Case. May not work for all Supermicro 2U SuperServer, subject to manufacturer. Manufacturer Supermicro. Solid State Drives. Hard Drives. Part Number 01-SC81302. Check parts for our serial numbers before sending back. Our servers and parts are tested for full functions, R2/Ready for Reuse. Manufacturer's Part Number:SC93301. Part# SC93301 / 01-SCC93301-XX00C003 / MCP-220-00024-0B. For use in Supermicro Server SC826 SC846. For use in Supermicro Server SC826, SC846. Used Pull -The product has been removed from a working system (e.g. server). New Condition Supermicro MCP-220-00075-0B Gen 5.5 Hot-Swap 3.5" HDD Tray. 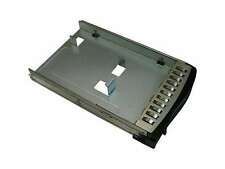 Supermicro 2.5" hard drive caddy Tray SAS SATA. Can put your interposer in these(interposer not included) . Boardroom Technologies will provide top level service and will do everything in our power to satisfy all your needs. This item is tested and is in good working condition. We’ll resolve the issue and make it right! Condition:- This is a USED Lot of 4 SuperMicro 05-SC82708-XX00C104 3.5 SAS SATA Swap Hard Drive Caddy ONLY- These are used SuperMicro Caddys. Overall condition is GOOD. We will do our best to help you out. Condition is Used. Compatible with the following SuperMicro Chassis Multiples available if more than one is needed. 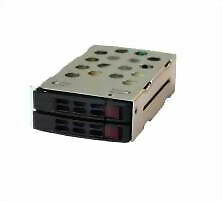 Application: 3.5" Drive Bracket for Supermicro 2U Rackmount Chassis. pulled from Supermicro Superserver 6023P-8/i 2U Rackmount Case. For use with or pulled from: (for reference only).